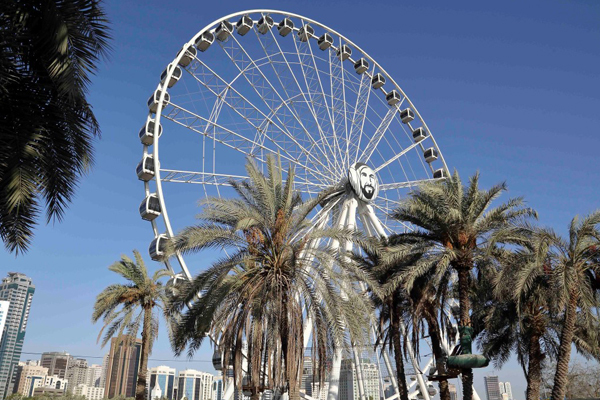 Sharjah’s iconic 'Eye of the Emirates' has been relocated to its new home in the heart of Al Montazah Parks. At the new location, it will offer visitors even more spectacular views when it reopens later this year, a Wam news agency report quoting Sharjah Investment and Development Authority (Shurooq) said. The emirate’s most recognisable landmark will re-open to the public when Al Montazah Parks, Sharjah’s premier amusement and water park, is fully completed. One park, Pearls Kingdom, started welcoming visitors on the first day of Eid Al Fitr. The move from Al Qasba, home to the wheel for 13 years, will provide a stunning vista of the city’s major attractions and famous markets, such as the Central Souq, Al Jubail Souq, Al Majaz Waterfront, Khalid Lagoon, The Flag Island, Al Noor Island and Al Noor Mosque, the report said.